Aesthetics are extremely significant to both morale and productivity within the workplace. Not only do employees already have a long checklist of things that they need to accomplish each day, but having to deal with faltering and nonfunctional office space simply adds more tasks to their lists. For instance, colors are one aspect that can impact the mood of an office environment. Red tends to make people feel more passionate about their work while yellow tends to make people feel happy. When planning the interior design of an office space, we create spaces that businesses want to work in with a focus on modern, professional aesthetics. The physical and structural layout of an office space is another aspect that is just as important. With multiple conference rooms, lounges, and shared spaces, our business centers provide a host of workspaces available to you anytime in addition to your private office. Here at AdvantEdge the design and décor serves to create functional workspaces that help your company work efficently while also providing polished fixtures that also impress your clients. Tacky furniture is also another misdemeanor just waiting to happen. Working in an office with worn furniture can be uninspiring. Talk about lack of professionalism. Imagine how embarrassing it would be to invite your (potential) client into your office to talk about serious issues and having to convince them to sit down in an outdated, uncomfortable chair? We know that maintaining professionalism is a key in the business world and we strive to help you put your best foot forward. To recap, if you can relate to the scenario above, it is probably a good idea to find another office space that is conscious of workplace aesthetics. Here at AdvantEdge, we are attentive to design and we build our offices around your business. From choosing appropriate furniture to the physical and structural layout of our offices, we are always conscious of what our clients need and we work with you to make sure your workspace portrays your business in a positive light. 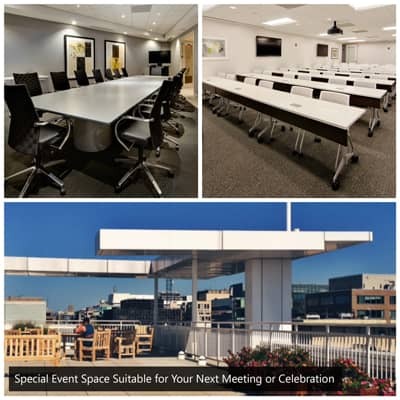 Click the button below to learn more about our offices and schedule a tour at one of our three business centers in Washington, DC.